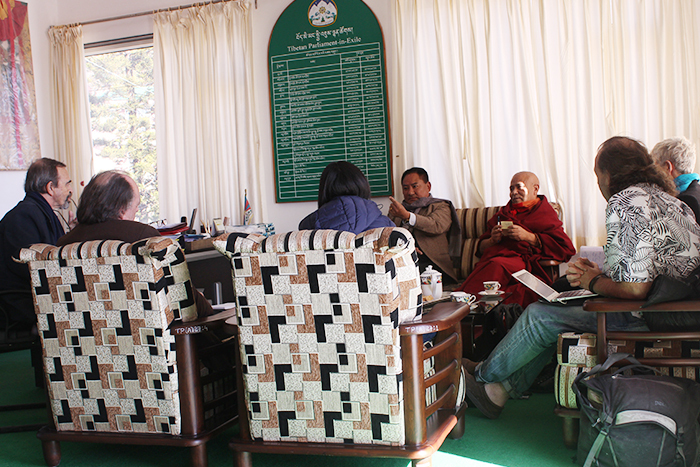 Speaker Pema Jungney and Deputy Speaker Ven Acharya Yeshi Phuntsok with delegation members from Geneva. 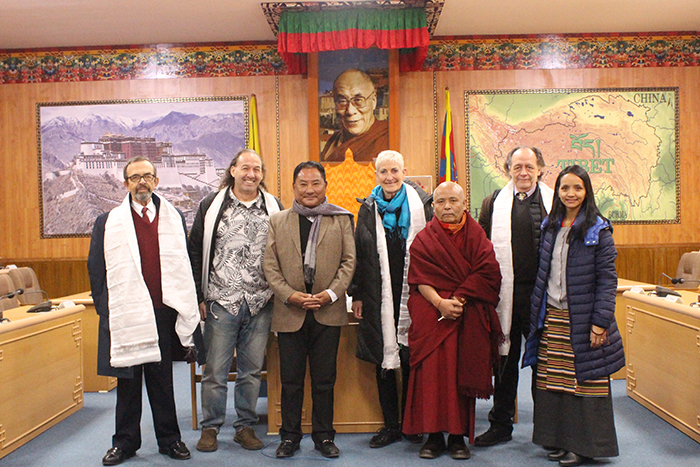 Dharamshala: Geneva Delegation members Adrien-Claude Zoller, Marguerite Contat, Yves Lador, Joshua Cooper along with Kalden Tsomo visited Tibetan Parliament-in-Exile on 14 January 2019 at around 11 AM. The delegation members were received to Speaker’s chamber by Speaker Pema Jungney and Deputy Speaker Ven Acharya Yeshi Phuntsok, delegation members were introduced by the office of the Tibet Geneva staff Kalden Tsomo, Speaker and Deputy Speaker also introduced about their background. Then through question and answer, Speaker and Deputy Speaker elucidated the questions asked by the delegates regarding composition, proceedings and functions of Tibetan Parliament-in-Exile, members also asked about the formation of policies regarding human rights and environment of Tibet and about annual budget. They also asked about the rules and regulations and charter adopted by Tibetan Parliament-in-Exile. Speaker and Deputy Speaker jointly responded to the questions, firstly briefed about the composition, proceedings, and functions of TPiE that the Tibetan Parliament-in-Exile is unicameral consisting 45 members and sessions of Parliament are held twice a year. When the Parliament is not in session, a Standing Committee of 11 members attends office fulltime and meet twice a week that work on the interim budget and other issues related to Kashag and the general public. Tibetan Parliament-in-Exile also visits various countries to meet parliamentarian, Think Tanks, officials, Tibet supporters, media, and Tibetan communities. TPiE receives various international parliamentarians and dignitaries during the session and other official functions, TPiE conduct the world parliamentarian convention in several countries. They spoke about self-immolations, destruction of culture and environment, human rights and religious activities controlled by the Chinese government and the situation inside Tibet. Speaker and Deputy Speaker also talked about the value and importance of Tibet’s environment and about the resources and budget of the year. They also spoke about the 27 laws, rules and regulations enacted by TPiE. Delegation members suggested increasing the number of participants during International Environmental Convention and U.N Counsel meeting in Geneva and in the USA to get more support and to pressurise the Chinese government. Lastly, Speaker presented and honored the delegation members and visited the parliament hall.